Remotely adjust the manual power settings of your flashes in up to three zones (groups). You can have as many flashes in each group as you want. Get more light, faster recycling times and more shots per battery with Panasonic’s High Speed Sync (HSS) mode, optimized by PocketWizard’s ControlTL technology. Now you can take advantage of this great feature and shoot wide open in full sun with remote speedlights. HyperSync allows photographers to achieve faster X-sync speeds with full power flash. Now you can cut the ambient light and use wide-open apertures outdoors in bright sunlight. That extra speed can also freeze action, whether shooting models or athletes in motion. *Every camera/flash system performance will be different. Works with all PocketWizard radios on the same frequency including PocketWizard OEM Partner products like Sekonic meters and Profoto, Bowens, Calumet, Dynalite, Lumedyne, Norman and Photogenic flash packs for standard triggering and HyperSync. 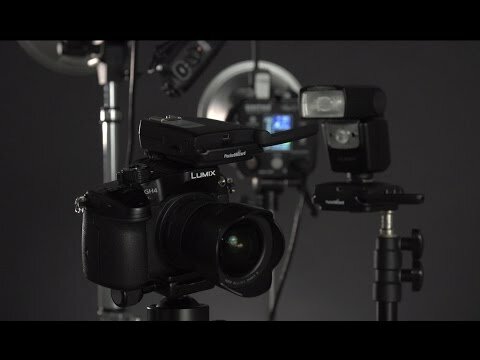 Using a standard USB connection and the free PocketWizard Utility, you can easily configure your channel settings, dial in your HyperSync timing, adjust your sleep-mode timers and update your product to the latest firmware whenever updates are available. PocketWizard’s Auto-Sensing Transceiver Technology enables the FlexTT5 Transceiver to switch between transmit mode and receive mode automatically for greater flexibility on the job. Easily trigger a remote camera in sync with a remote flash with Auto-Relay Mode. Put a camera where you can’t be and use either remote TTL or non-TTL lighting or both at the same time. Use your Panasonic camera’s flash menus to control the power of up to 3 Groups (zones) of light. The FlexTT5 Transceiver has two plug-in ports for use with remote cameras and other flash packs. With its Auto-Relay Mode, the FlexTT5 can trigger a remote camera and transmit to a remote flash at the same time.